If you read yesterday's post about what we ate in ADK, you know we consumed a good amount of sushi after the half marathon. But we couldn't stop there. When we returned home Monday afternoon, we needed more. So, we decided to treat ourselves to a few special items at the grocery store. 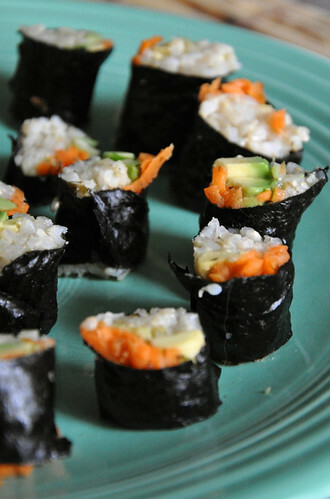 What follows are instructions on how to make sushi (an avocado roll with carrots, specifically) -- and they're likely not the "right" or "authentic" methods, but they work. And that's all that matters, right? Right! Prepare rice according to package directions. Allow to cool in refrigerator (you want it to be cool and sticky). Whisk together the vinegar and agave, then pour it over the carrot shreds. Slice the avocado very thinly (I chopped it into fat chunks that didn't stay inside the roll at first, didn't work). Find a clean work surface and Lay out your ingredients for easy placement. 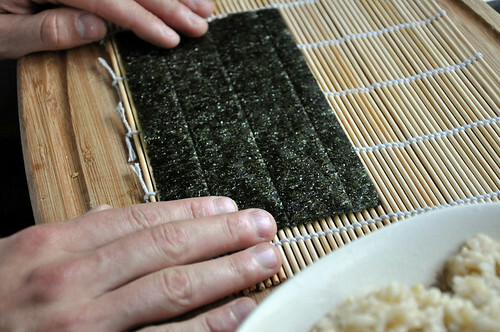 On your rolling mat, place a piece of the dried seaweed/nori, then place the rice at one end -- covering about 1/3 of the nori sheet. Press down with your hand until flattened (I included a Ziplock bag in the What You Need part because it helps with pressing down the rice so it won't stick to your hands). 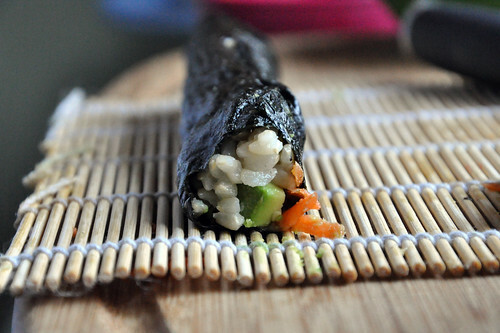 Then top with avocado slices and carrots. You may also use fish or other ingredients (Stephen used a fake lobster of some sort). Go wild. Or keep it simple. Whatever you want. Here's the fun part: Rolling. 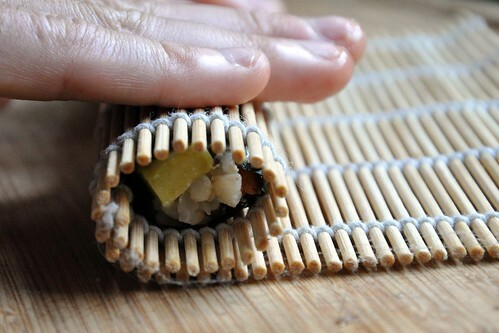 Using the rolling mat, begin to roll the sushi (tightly). You'll want to start at the side nearest to you and roll away. 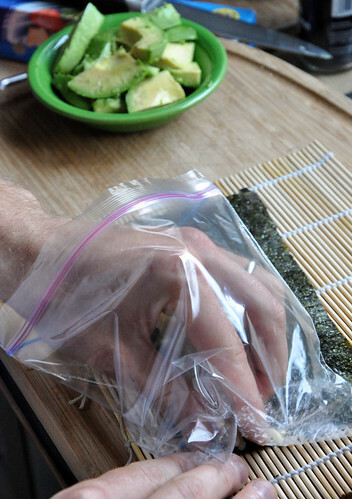 Then when you've rolled it entirely, use a little water to help seal the edge. 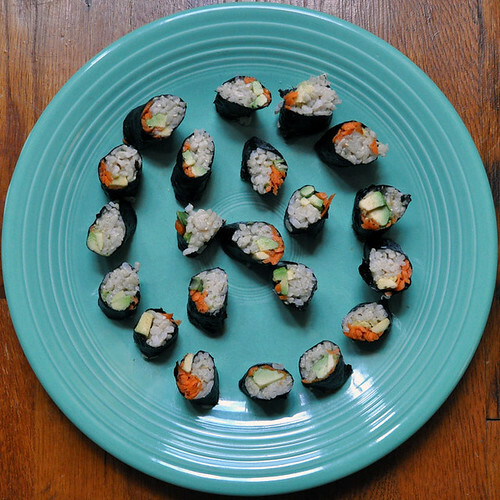 Set aside until you've made more rolls -- then use a serrated knife (it makes the process so much easier, trust me!) to cut into smaller chunks. 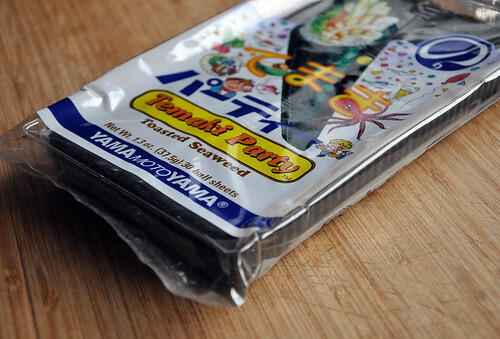 Serve with a low-sodium soy sauce. Again, I realize these instructions aren't very technical -- nor is the sushi professional looking, but I hope the photos help you. It tastes amazing. 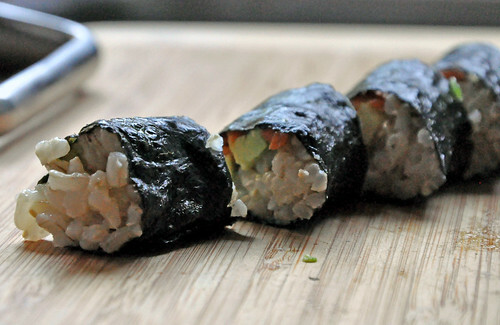 It's slightly healthier by using brown rice. 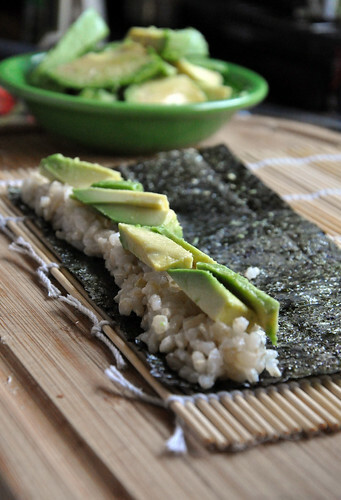 That all being said: If you have a better way to make at-home sushi -- we'd love for you to share it with us! Just leave a comment or email us at neverhomemaker [at] gmail [dot] com.